Nova Ocean View. This is a boutique style condominium located in the popular Pratumnak Hill area. Minutes away from one of the best beach around, it’s a quiet residential area, with lots of local amenities at hand. From Pratumnak Hill Jomtien Beach, or Pattaya City are a 5 minute taxi ride. This is a Huge 140sqm 2 bedroom, 2 bathroom unit. 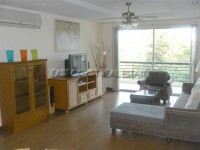 It is fully furnished in a modern style, has 3 air conditioners, LCD TV’s and good quality furnishings throughout. The building provides a fitness centre, and a rooftop ocean view communal swimming pool. Close by are Thai-European restaurants, small bars, laundry service, convenience stores, and also a night market across the street. It is available for both 6 month or Long term rental. Hurry, This Private pool condo wont last long! !